NAMM 2018: Rated at 600W - not, sadly, the originally touted 666 - Ashdown's Head of Doom, designed to the demonic requirements of Black Sabbath bassist Geezer Butler, was born following discussions between the firm and Butler's long-serving tech Terry Welty. At its heart the bass head is built around the flagship ABM range, so Ashdown aficionados should be on solid ground before layering in the 9-band eq, which combines bass, mid and treble controls augmented by six sliders to cut and boost as required within these ranges. But the Head of Doom's most distinctive feature is undoubtedly its frankly intimidating footswitchable sub-harmonic generator, which adds an octave below the played notes. It's fair to say that Ashdown founder and Managing Director, Mark Gooday, is happy with the firm's collaboration with his childhood hero. “What a moment for me personally. Having grown up playing Sabbath with a band in school and learning all the bass lines with my mate Phil, who could play any guitar lick back after hearing it once," he says. "Geezer’s sound and tone was part of my bass upbringing and has stayed with me until this very day." "Geezer has used our Drop Head 30 Valve combo for practice and home use for a number of years, so after discussion of building a gig-ready rig, we naturally began by building all-valve amps... however we quickly learned that Geezer wanted to achieve a sound that was a little different to this. 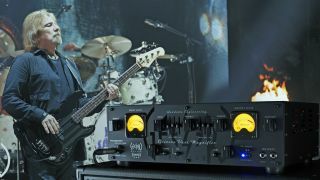 "Geezer uses a complex combination of amp and cabinet arrangements depending on the gig, so it was a nice challenge for our technical team to overcome, with the backing and support from Geezer’ s tech Terry Welty. "My son, Dan, spent a lot of time with Geezer and Terry to make the project a success and I’m thrilled with the outcome." The Head of Doom is available now, retailing for around £1099/$1499. For more details, hit up ashdownmusic.com.